Greens fees: Weekdays, $12 (9 holes, walking); $21 (senior, 18 holes with cart, weekdays); $27 (18 holes with cart, weekdays); $30 (18 holes with cart, Saturday and Sunday); Thursday special, $30, two players, 18 holes with cart. Powderhorn Country Club is a heckuva nice course and a first-rate value. If you haven't made the drive to Madison Township to test your game there, you owe it to yourself to do so in short order. From the tips, Powderhorn measures just a shade over 6,000 yards. At least in my mind, it plays longer than that. Tee-to-green conditions are exemplary for a place at this price point. There isn't anything I don't like about Powderhorn, save for the fact that a couple of its holes almost always defeat my best-laid plans. Let's start with the par-4, 423-yard first hole. There is tree trouble left and right on the course's No. 1 handicap hole. Better get your drive out there long and in the right place or your brain will race as you ponder the approach shot over the pond that guards the front of the green. For argument's sake, let's say you knock it out there 240 yards in the short grass. You are left with a medium-to-long iron shot that places maximum value on distance control. There are only three paces from where the water ends to where the green begins. A gut-check shot at any point of the round, it's a super-stiff challenge on the opening hole. I've made a couple of birdies on this hole, a few snowmen and more bogies and double bogeys than I'd care to acknowledge. The par-4, 391-yard third hole is a dogleg left that lends itself to a brains-over-brawn philosophy. Big hitters should leave the big stick in the bag. Dial back to the utility club or long iron, pick a spot and take your chances with a mid-iron approach up the hill to a well-bunkered green. Par here is golden. Accuracy from the tee is required on the par-4, 365-yard sixth hole. You need to get by the large tree guarding the left side of the fairway to set up the approach shot over a pond guarding the large, sloped green. As par-3s in this corner of the world go, the 210-yard eighth hole is a knee-knocker from start to finish. Stray left or right with the tee shot, you're in trouble. Missing short between the sand bunkers is good. Missing long, left or right is bad. Leave yourself a long first putt on the wrong side of the hole, and you're staring a three-banger in the face. Length and accuracy off the tee are a must on the par-4, 442-yard ninth hole. Shoot your drive into the rough on the left or tree line on the right, and your chances for hitting the huge green in two or finishing the front nine with a par are slim, indeed. The 460-yard, par-4 10th hole resembles the first hole - green guarded by water in front - and offers every bit as stiff a challenge. The card has this as the No. 2 handicap hole. I say it's no worse than 1A. "Sneaky'' is the appropriate adjective when applied to the par-4, 378-yard 12th hole. What looks easy from the tee is anything but easy if the drive doesn't finish in the short grass. The par-4, 248-yard 13th is one of the best holes in Lake County. Do you treat it as a long par-3 and bust the tee shot, aiming to fly it to the elevated green with devilish slope? Or, do you go with a 160-yard iron off the tee and take your chances with a wedge? This is a risk-reward special. A big gap between front and back tees - 140 to 176 yards - adds spice to the par-3 14th hole. Whichever tee you choose, you're hitting over a gorge to a slippery green. Big hitters certainly can navigate the uphill climb and reach the green on the par-4, 277-yard 15th hole. Still, I wouldn't call this an easy hole for the average player. The par-5, 547-yard 16th hole is my personal nemesis. It eats my breakfast, lunch, dinner and late-night snack no matter how diligently I work to get my brain in the right place. Challenges await on the par-3, 165-yard 17th hole. There is plenty of trouble between the tee and green, both elevated. The green is large and loaded with breaks. Don't hesitate to tee it high and let fly on the par-4, 265-yard 18th hole. This isn't a great finishing hole, but it offers the welcome opportunity to end the round on an upbeat note. Greens fees: Weekdays, $12 (9 holes, Mentor resident, walking) to $38 (18 holes, cart, weekends); weekends, $14.75 to $41.50. Here are some of life's certainties: death...taxes...year-round affordable golf at Black Brook, weather permitting. But it isn't just affordability and availability that are the best features of Black Brook. With consistently clean greens and well-manicured fairways, quality is a persuasive calling card of the time-tested track in Mentor's north end. and opened in 1929, Black Brook is one of this area's oldest and best public courses. It has loyal customers, a good pro shop, fine snack bar and the reputation of being a friendly golf venue. Tim Ausperk has been the head professional at Black Brook for 21 years. He's a solid businessman and highly-regarded instructor whose summer youth clinics and leagues have introduced uncounted thousands of young people to golf and golf etiquette. The same as all area courses, Black Brook got off to a slow start this season when bad weather kept golfers off the course through all of April and most of May. Lousy weather also pushed back completion of the total rebuilding of the practice range. Last week, the bulldozers were in the final stages of shaping the teeing areas, mounds and target greens that will be the range's efining features when it re-opens later this summer. We'll keep you posted on progress. "User-friendly'' is the apt description of Black Brook. It isn't a long course, even from the tips, but it's long enough to provide a challenge to the vast majority of golfers. If you shoot a low number here, you'll feel good about it. Black Brook has plenty of character. The front nine, although by no means a sprayer's paradise, is more open than the back. The par-4 348-yard first hole is straightforward and generally benign, but it can bite you if you miss the green that offers the first taste of the course's first-rate putting surfaces. I've always loved the par-4, 366-yard second hole. Most golfers hit their second shots from the top of the hill, over a deep swale with a creek to an elevated green with pronounced back-to-front slop. Throw in some wind, and it's one of the most challenging approach shots on the course. The par-4 third hole and par-5 fourth hole present chances for birdies provided that drives are hit to the right spots and approach shots are true. On the challenging, par-4 fifth hole, drives must be both long and accurate to keep you in the running for par. Make a birdie here, and you've gained a stroke on most of the field. Not many courses offer back-to-back par-3s as closing holes. Black Brook does with the 161-yard eighth and 154-yard ninth holes. The eighth faces due west and almost always plays into the wind. The ninth looks easy enough until you miss left or right into trees. Big bangers can drive the par-4, 284-yard 10th hole. We mere mortals must be content with making sure our tee shot does not stray left toward the 18th hole, where a picket line of mature trees looms like prison bars. The toughest stretch of holes on Black Brook begins with the par-3, 185-yard 11th. From the back tee, it plays at 200 yards over a swale with water to an elevated green. Remodeling of the par-5, 484-yard 12th hole has had the desired effect. It looks better and plays better than it did as a non-descript par-4. The par-4, 352-yard 13th is the easiest hole on the back nine as long as your tee shot is reasonably long and between the trees. Par is golden on the final fivesome of holes. I suspect better players feel they can have their way with the par-5, 460-yard 16th hole. A deep, narrow, well-guarded green is the separator on the par-3, 159-yard 17th home. Black Brook saves its best for last. The par-4, 436-yard 18th requires a well-place, long tee shot. Even with your optimal drive of the day, it's decision time on whether to go for the elevated green protected by trees on the left, a creek crossing the fairway and retention basin on the right. Play this course once and, chances are, you'll come back for more. Play this course and make a birdie on 18, and your day will be made. Today's chipping tip from Bryan Huff focuses on body position and includes Bryan's tip to think of striking an old-fashioned wooden match while planning a chip shot. 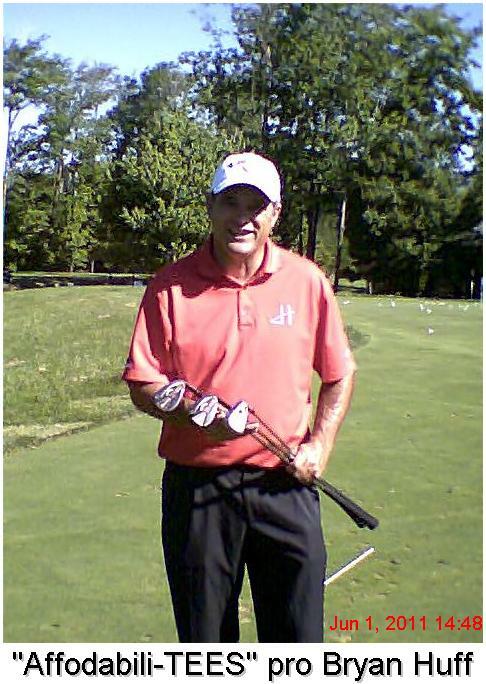 Huff is a lifelong Willoughby resident and an instructor at the Jummy Hanlin Golf School at StoneWater Golf Club in Highland Heights. Coming up Friday and Saturday in Part III: The importance of weight shift while chipping off a tight lie. Most days, for most golfers, rounds are made or spoiled by how well they play around the green. A good chipping game often spells the difference between a shooting 90 or 95, 85 or 90, 80 or 85 and on down the line. In this opening installment of a four-part series, teaching pro Bryan Huff breaks down the basics of chipping. The series was shot at StoneWater Golf Club in Highland Heights, where Bryan is an instructor at Jimmy Hanlin Golf School. To book a lesson with Bryan, call 440-382-5305. His rates are $40 for 30 minutes, $75 for one hour and $200 for three hours. He also offers a special rate for younger players, ages 23 and under. Thursday, Part II: More fundamentals, including body position and Bryan's tip to think of striking an old-fashioned wooden match while planning a chip shot. Friday, Part III: The importance of weight shift while chipping off a tight lie. Saturday, Part IV: Bryan offers an overview of chipping techniques, using three wedges from three positions.